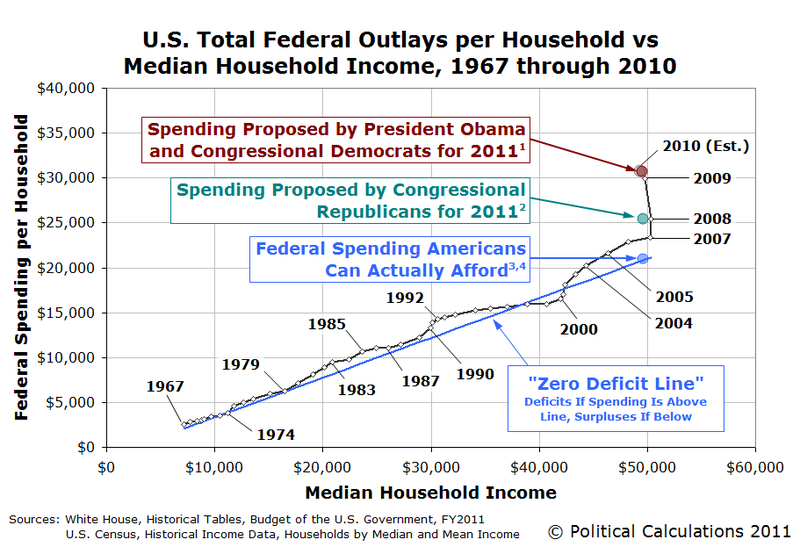 If you want to quickly see how President Barack Obama and the Congressional Democrats’ federal government spending proposal for 2011 stacks up against what Congressional Republicans have in mind, shown against a background illustrating the trend in U.S. federal government spending since 1967, here you go! 1 Obama, Barack. The State of the Union 2011: Winning the Future. White House. 25 January 2011. 2 Sonmez, Felicia and Kane, Paul. House Votes to Cut Spending to 2008 Levels. Washington Post . 25 January 2011, 6:25 PM. 3 Independent Institute. Aim at the Zero Deficit Line. 13 January 2011. 4 Political Calculations. How Much Federal Spending Can Americans Afford? 7 December 2010.